STAFF EDITORIAL | Do Mills students lack school pride? With a new school year comes a plethora of new students. The first few weeks of the semester is often when first-year and transfer students gain their first clue as to whether or not they made the right decision in coming to Mills — whether they will find the sense of solidarity and community they were looking for, and the pride that comes with it. The Campanil has noticed a lack of community when it comes to participation in campus events. Sporting events at other colleges boast full stadiums of screaming student fans, but at Mills it seems that the majority of attendees at sporting events are either family members or friends of the athletes. The small number of activity-goers isn’t just true of athletic events: readings, music performances, dances, and other events often take place in near-empty rooms. We believe that the lack of participation is partially because the current generation is largely apathetic, but many of us also feel that word does not get out enough about happenings on campus. We need a cohesive campus calendar, which is something The Campanil wants to get off the ground. Lack of event information makes it difficult for many students to find the sense of community they want. Furthermore, it seems that a fair amount of the students that do know about events are unmotivated to go unless they are required to do so. A lower level of pride and overall campus energy could also be attributed to the fact that Mills is significantly smaller than other nearby colleges, or that Mills does not place as much emphasis and value on athletics and the like as a larger or coed college does. The Campanil believes that a unique place like Mills has the potential to be bustling with pride. Some of us believe that our level of pride has dramatically changed since the days of the Strike—are any of us so prideful of the Mills we know and (hopefully) love that we would skip our finals if someone dared to change us? Maybe our students still harbor that pride and would step up to take action if the situation called for it, but perhaps the reason we don’t see as much action within the Mills community as we once did is because it now takes place online and through social media. 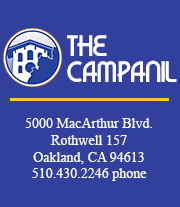 We at The Campanil believe that while Mills does have pride, it is a pride much different from that of other colleges, such as UC Berkeley. Maybe Mills students don’t walk around covered in blue and gold face paint, or flock to every sporting event, but many of us would like to believe that students are still proud to be at Mills even if it is not outwardly expressed in the typical college style. Perhaps Mills students show their pride through their academic achievement and dedication rather than through how much Cyclone paraphernalia they have in their closet.